Chelsea are set to spend big on Crystal Palace Star Wilfred Zaha as they seek to bolster their attack before the end of the transfer Window. The Blues are reportedly in for the Ivorian international according to the Mirror. It is claimed that new manager Maurizio Sarri is interested in the 25-year-old as his unique style fits into the attacking profile wanted this season. Wilfred Zaha has been the subject of several speculations this summer as he rejected an offer from Everton this summer. He is believed to favour a move to Tottenham or Chelsea. However, any transfer for the wide man is dependent on the club’s willingness to stump out a premium fee for the former England u21 international. Crystal palace value Zaha at £75 million which has proved problematic to Tottenham. The North London side are not known for expensive purchases of players and have baulked at paying such huge price for the forward. This leaves Chelsea in pole position to secure the transfer of the highly rated forward. 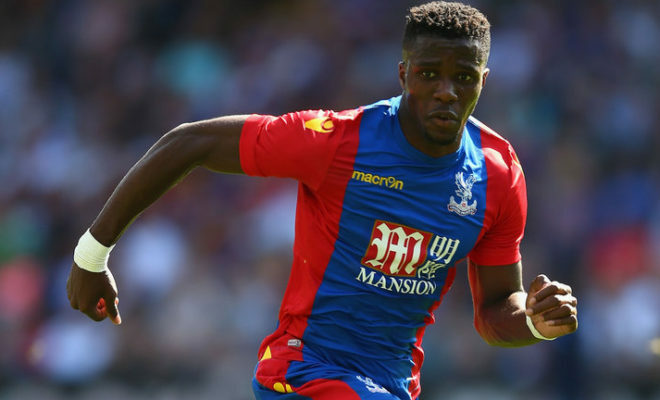 Zaha was instrumental last season scoring 9 goals and providing 4 assists as Crystal palace escaped the relegation drop. With less than a week left in the transfer window, Chelsea chiefs are ready to sanction the move to make Zaha the club’s record signing. Zaha capture would be good for the Blues as it gives the FA Cup winner an additional threat on the wings however the £75 million fee would be hard to justify for his services.